Dixie Cove Marine Provincial Park on Hohoae Island provides the best all-weather anchorage in Kyuquot Sound and a scenic stopover where boats can anchor and enjoy spectacular views of surrounding mountains. 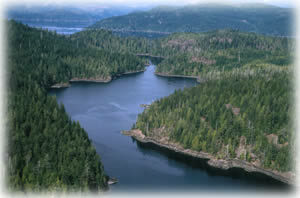 The wilderness area behind the anchorage contains old-growth rainforest. From this anchorage you can safely explore nearby Rugged Point Marine Provincial Park and the rest of scenic Kyuquot Sound. The park does not have a boat launch. There is a boat launch at Fari Harbour. There are two excellent anchorages in Dixie Cove. Follow the narrow channel between Copp and Hohoae Islands to find the first anchorage. Farther inside the channel to the west sites an even more secluded cove, which is more protective and shallower with a mud bottom. Boaters can reference marine chart #3682 (Kyuquot Sound) for more information on this area. Dixie Cove is located on Hohoae Island in Kyuquot Sound on the west coast of Vancouver Island, approximately 25 km northwest of the town of Zeballos. Access to this park is by boat only. There are two excellent anchorages in Dixie Cove. Follow the narrow channel between Copp Island and Hohoae Island to find the first anchorage. Farther inside the channel to the west sits an even more secluded cove, which is more protective and shallower with a mud bottom. Boaters can reference marine chart #3682 (Kyuquot Sound) for more information on this area. Cultural Heritage: Kyuquot Sound is the traditional territory of the Kyuquot/Checleset First Nations, who inhabited this area for thousands of years. The first European to visit this area, Captain James Cook, arrived in 1778. Cook was followed by the Spanish, British and American traders in search of sea otter pelts. As the population of sea otters dwindled, this trade was replaced by sealing, whaling and eventually, fishing, logging and tourism. Conservation: The park protects representative vegetation and wildlife. The calm, sheltered waters within Dixie Cove provide a tranquil place to explore by canoe or kayak. Fishing is permitted as per provincial and federal fishing regulations. All anglers should check the current regulations issued by Fisheries and Oceans Canada prior to fishing. Anyone fishing or angling in British Columbia must have an appropriate licence.